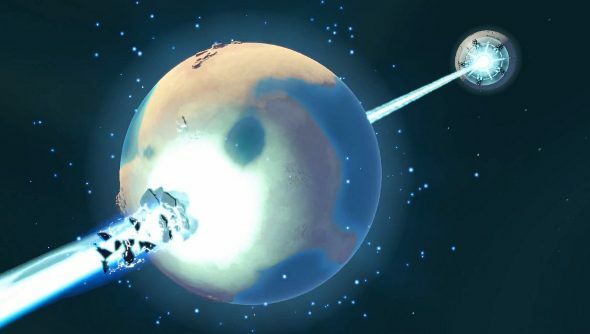 Uber Entertainment has decided that the studio’s world-destroying RTS, Planetary Annihilation, is almost ready for launch. In just over a week, on September 5th, the game will leave Early Access behind. It’s been a good long while since we took a look at the game. In my Planetary Annihilation Early Access review I advised patience, as it was only just getting meat on its lovely bones. But a lot’s changed since then, with the inclusion of Galactic War and the new features introduced in the gamma phase. We’ll no doubt be taking another look next month, but in the mean time, here’s the launch trailer. The launch edition will introduce more things to assist in your desire to blow up planets and dominate the galaxy. There’s the Annihilaser, which will essentially allow you to make a Deathstar; new gas giant worlds; and upgrades that include enhancements to both the single-player and multiplayer portions of the game. If you have the Early Access version or are a backer, the pre-release build is being updated with these new features so you can get a handle on them a bit early. And if you’re at PAX Prime, you’ll be able to take a gander at and fiddle around with the release version on the show floor.